Trimble released their cloud based data collection solution called TerraFlex yesterday and I spent much of the day playing with it on both the iPhone and the Juno 3D. Some observers (including me) thought TerraFlex would be a shot aimed at ESRI’s ArcGIS Online product. It is clear, however, that TerraFlex is a very different animal. Whereas ArcGIS Online is a map-centric platform against which you collect data, TerraFlex is a forms-based data collection platform that uses simple maps only as a background. TerraFlex is better described as ‘TerraSync lite’ and the focus is on simplified data collection tasks using a variety of handheld devices like iOS and Android smartphones and Windows Mobile devices like Trimble’s own Juno-series data collectors. 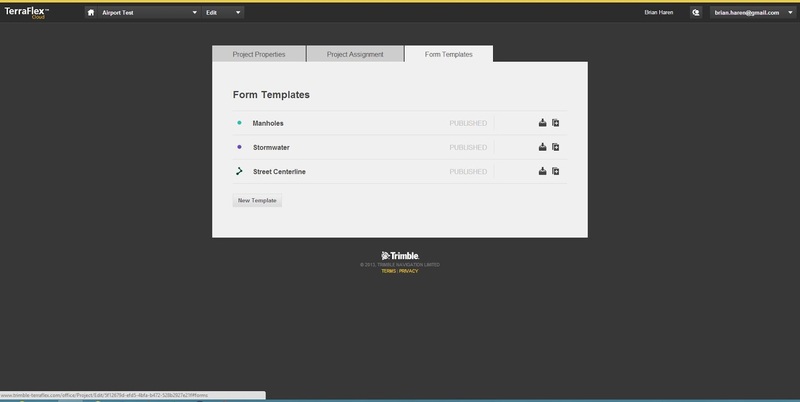 All projects start with forms, and TerraFlex provides an easy to use web interface for creating the data collection form. The TerraFlex form creation page. It is surprisingly simple to use. Once you create a form you upload it to the TerraFlex ‘cloud’ (hosted on Amazon’s EC2 cloud servers) as part of a data collection project. 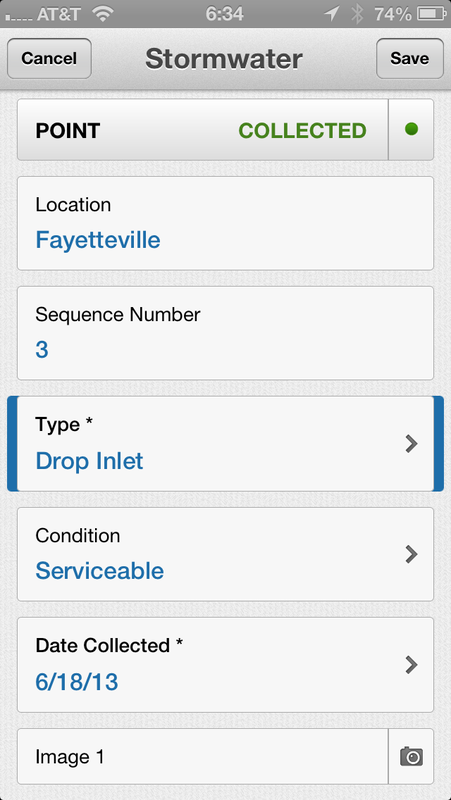 Once you have the project uploaded to the TerraFlex cloud you can log into TerraFlex from your mobile device, download the project and its assigned data collection forms and start collecting data. 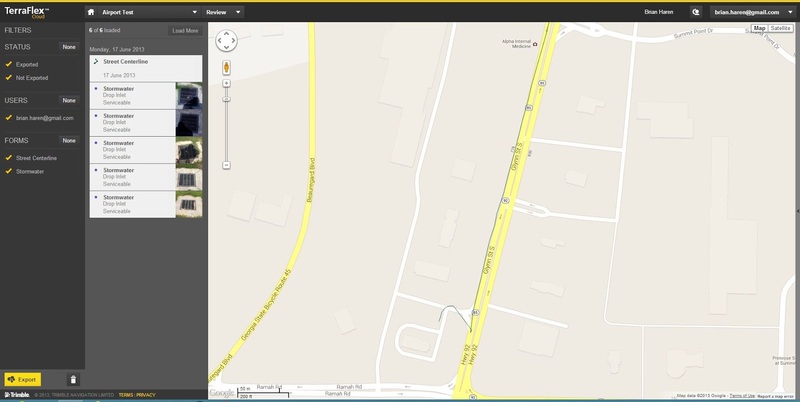 TerraFlex uses Google Maps/Earth as the map interface. It’s your ONLY map option! You can set your options on your data collector to sync the new data immediately over any available network connection (cellular data or wi-fi) or set it so sync only when the device is back under wi-fi coverage (this will reduce data plan usage on devices like the iPhone). Once your data is synced with the TerraFlex cloud you can go back in to the desktop web interface and view the data, do basic edits and export it for use in other packages like ArcGIS or AutoCAD. Overall I was impressed with the ease of use of all components of the TerraFlex system – from the forms creation on the desktop to the data collection on my iPhone to the data management back in the desktop interface. Part of the ease of use stems from the fact that there’s not a lot there! 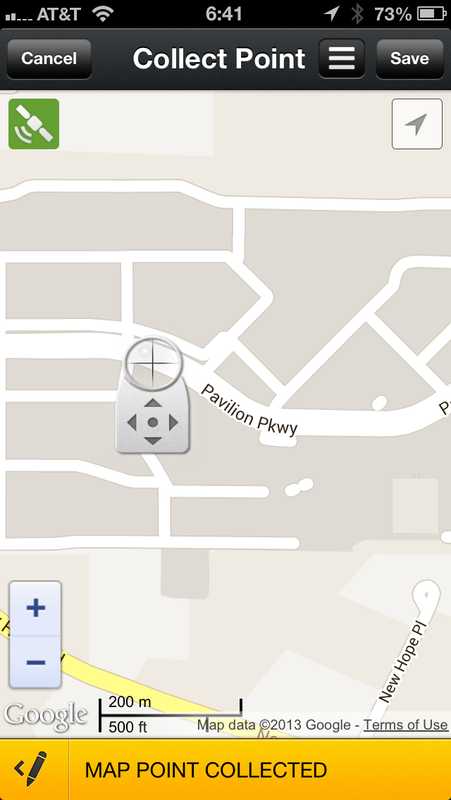 Remember, this is not a complex web mapping package like ArcGIS Online. TerraFlex is a simplified data collection tool and at that task it excels. Trimble also got smart with the pricing. TerraFlex is licensed by the individual user vs. a software license tied to a particular piece of hardware as with TerraSync. A TerraFlex license cost is $250 per user per year. The subscription is tied to the individual and Trimble doesn’t care what device(s) you use or how much data you collect. Two hundred and fifty bucks may seem like a lot, but if you’ve ever priced other GIS data collection software like TerraSync (over $1,000/license) or ESRI’s ArcPad (about the same) or even an ESRI ArcGIS Online subscription (which starts at $2,000 and has much higher management overhead) suddenly the cost of a TerraFlex license looks downright reasonable. Of course at this price the list of what you don’t get is pretty long. There’s no data position correction capability either through the use of a virtual reference station or via post-processing. The data import and export options are also very weak. This area in particular needs a lot of work. Your export options are either KML, .csv (spreadsheet) or the ESRI ArcGIS XML format. The .csv format has some issues because the software concatenates the lat/long data into a single spreadsheet cell, making it tedious to parse the latitude and longitude data into separate columns for easy import into GIS and CAD. But this is a first generation product and I’m sure things will improve. Trimble provides support via their TerraFlex forums and their technical people were jumping right in yesterday and answering customer questions. I’m sure they are compiling a list of future improvements, and the great thing about cloud-based services is that you don’t have to wait around for a service pack release. Things get updated in the background and are immediately available across the entire user base. Overall I like what Trimble has done here. We’ll keep an eye on this product as it moves forward! This entry was posted in Software, Tools and tagged terraflex, trimble by Brian Haren. Bookmark the permalink.